We've got about 50 days before early access starts for the SWTOR Knights of the Fallen Empire expansion. Doesn't seem that far away actually. Things are going to change quite a bit for level 60 characters once they accept the quest. Rumor has it some content will become unavailable at that point. So, what should we be doing before that happens? 1) Companion Quests. You know, the ones we get through affection. Since companions will be lost, now is the time to do them. I'm grinding out companion gift missions to get this done. Of course, BioWare said there will be a non-story way for us to access some old companions, so these *might* still be available. I'm not going to take that chance though. 2) Solo Flashpoints. They are making the Flashpoints all adaptive, so that likely means no more soloing the old underlevel instances. HOWEVER, they are adding Solo modes. So if you want to do it the old fashioned solo way, now is the time. No solo Operations, so if you still want to try those, do it soon. Might want to try and solo those older Hard Mode flashpoints now. There is probably a bunch of other stuff, but we still know so little about what's happening with the leveling experience. One of the big announcements to come out of the SWTOR livestream was that companions will no longer gain stats from the gear you give them. They will still use the cosmetics though. Instead, they grow in power as you level. Right now, you gear them as you would yourself. At first, I was a little worried about this change. But, now I think it is a good one. On the surface, gearing your companions is neat. I like party management. However, it quickly loses its luster. If you have one character, you could have around 8 companions. Ok, that's manageable. Have an Alt? That's 16, have 5 alts? That's 40. It quickly becomes unmanageable. You end up only really using one maybe two of your companions because they have gear. The rest just sit around. One thing BioWare did not mention in the livestream is that individual characters are going to have more companions than ever. We'll have 5 story companions, that's known. We can also reclaim our classes old companions in a non-story way. We can also get some other classes companions. We will also be able to get companions from the Cartel Market. It's becoming more of a collectible system than the static system we had. I certainly don't want to spend the majority of my time collecting modules so I can use this myriad of companions. Now, I'm sure some people do like that. Someone always likes something you wouldn't expect. Honestly, these days I don't even care how my companions are geared, just that they are at level and look decent. I'm sure I am not alone. No Spoilers here. 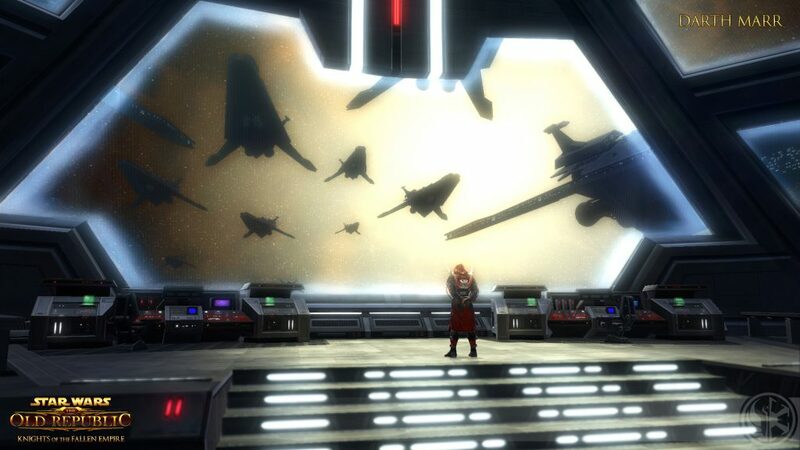 Last night SWTOR had their first real showing of the Fallen Empire expansion. Overall, it was good. There were some technical difficulties which caused an outage, and some volume issues. The stream quality was not great either, but I don't think that's a big deal. I can certainly wait to see it for myself. Now, on to the actual reveal. Demo. They showed ~10 minutes from Chapter 3. This looked really good. The art and world team did an amazing job. BioWare seems to be continuing their focus on quality. The cinematics were top notch. The world we saw was detailed and expansive. Gameplay was what you would expect, nothing new there. So yeah, it was really cool. I'm sure some people will be disappointed with the presentation, not me though. Saw some cool stuff, and am still excited for October 20th to get here. Yeah, I bought it. Who cares if it makes little sense lore wise? Like the armor, it looks cool and is fun. That's good enough for me. Surprisingly it was only 1,500 Cartel Coins. I was expecting something north of 2,000. I gave it to my Zakuul loving Bounty Hunter, and he was putting around Hutta with it. Tonight is a big night, the Fallen Empire live stream! Normally, this would not be a big deal, but it's the first time we are really going to get non-marketing info about the expansion. Less than two months until early access starts too. It happens at 8pm EDT. There is a chance I may miss it due to a family comflict, if so I'll watch it in the morning. I recently started up a Bounty Hunter in SWTOR. I played one a little bit back in beta, so it is mostly new to me. The main reason he was created was so I could wear the Zakuul Knight armor, and also drive the Zakuul Dropship mount being released today. I think the Prologues are some of the best parts of the game. Everything feels so new, so many possibilities. The stories are mostly pretty good on the starting planet. They are not too big either. You only have a few abilities, you pick your advanced class, you get your first companion. It's just a great time. There are still two stories I have never seen any parts of: Sith Warrior and the Smuggler. I'll likely get to these in the coming year. I'm definitely going to wait until Fallen Empire streamlines the leveling process. This Bounty Hunter will join the chapter rotation eventually. Right now, the Jedi Knight is the true character I am working on in Chapter 2. If only we could have even more prologues. Late last week, I finally got around to backing the Camelot Unchained project. It's been around two years since it started. Wow, has it been that long really? It has gone quick. Anyway, the main reason I didn't back at the start was the sheer amount of time it takes to make a MMO. Putting money up for something I may not get to play (in any form) for several years is a tough proposition for me. However, the game is going strong and beta is coming up soon. There was a delay, and the new date has not been announced yet. However, it is a timeframe that I am more comfortable with. Long ago, when Warhammer Online was still alive and kicking, I had a plan. I've always been a two subscription MMO kinda player. I wanted them to be WAR for PvP and SWTOR for PvE. I've been missing the front part of that equation though. With Camelot Unchained on the horizon, I will hopefully be able to fix it. The thing I really like about CU is their philosophy of not pleasing every MMO segment. They want a RvR focused MMO and that's what players are going to get. It's all about that. No PvE areas like we had in WAR. That's fine with me as I never really ventured out of the RvR lakes. The development team is quite open, so that should keep me busy until Beta happens. A couple of SWTOR things. Have a nice weekend! Livestream. Eric posted some information about the August 26th livestream on the forums yesterday. It will all be going down at 5pm PDT. As always with any time, there was much complaining. He also mentioned we will see parts of Chapter 3, which is mostly about us escaping from Carbonite. Finally, we'll also hear details about how companions will work! Will be nice to get some context around the datamined information. Interview. The folks over at Jedipedia were able to interview Charles Boyd, lead SWTOR writer, recently. It was decent, and the format was cool. Not too many new facts, but interesting background information none the less. I think the biggest piece of info was that Satele Shan is involved, somehow. That's not a big surprise, but glad to know the Republic is in there somewhere. BioWare has still been pretty quiet this week. Eric came on to the forums to say we'll get more detailed information... soon. I know, surprising. On the positive side, the PAX Cantina substitute live stream is going down next Wednesday! They really have no choice but to show us something then. I shouldn't say that, they could just end up showing cut scenes or something. Also, still loving the Zakuul Knight armor set. Best 1,400 coins spent. "Well, it's about time." said Tirvix as a figure walked through the doorway. The old gangster had his back to the door but could hear the new arrival come in. His attention was currently in an old Plasteel crate. It had certainly seen better days, as it had numerous scratches and dents. A gold reflection appeared on the wall, which the new arrival couldn't help but notice. "I was starting to think The Five weren't going to follow through with their threats." continued Tirvix, with amusement in his voice. He then glanced over his shoulder to identify the intruder. He then let out a rather insulting laugh and went back to looking in the crate. The figure in the doorway remained still and silent. "This is who they send? A nobody? Do you know who I am, boy? Why don't you turn around go back to your masters. Tell them to send a professional if they want to scare me. They will never sell their junk here!" All amusement was gone from Tirvix's voice. "I'm not here to scare you." said the Human in the doorway. He was average by all accounts, in shabby clothes. Clearly, one of the dregs of this world. The only thing notable about him was a scar covering a sizable portion of the left side of his face. In his hand was a blaster, which was now leveled at the gangster. "Oh" said Tirvix, whose voice was now calm and reflected the realization which had just come over him. He started to turn and speak, "Well then..." Suddenly, the blaster came to life, striking Tirvix in the gut. He crumpled to the ground, writhing in pain. The human started to walk over to Tirvix, but made his way to the crate he noticed earlier instead. "The names Orbavul, by the way." he said with a hint of amusement in his voice. As he rummaged around in the Plasteel crate, Tirvix lay on the ground next to him holding his stomach. "You made your point, go get help!" he managed to say, barely. "Where did you get this?" Orbavul asked about the contents of the crate. Tirvix angrily, "Get help, quick!" The blaster which Orbavul held was not pointed at Tirvix again, "Where", he repeated. "The Outer Rim, it was salvage from some wreck. I bought the whole lot. Now will you get help?" Tirvix pleaded. Without a word, the Bounty Hunter fired his blaster, striking Tirvix in the head. Turning his attention back to the crate, he said to the empty room "Yes, this will do nicely." Ok, that's enough of my horrible fan fiction. I had to come up with a good reason my Bounty Hunter had Zakuul Knight armor, didn't I? I'm really happy with the armor set, it looks awesome. Costs 1,440 CC on the Cartel Market. On Friday, the data miners over at TOR community posted the first information about the changes to the companion system coming in Knights of the Fallen Empire. Sadly, BioWare failed to deliver the information at Gamescom like they said they would. Thus, the data miners came though. You can check out the article here, they DO label when the spoilers start: https://torcommunity.com/database/update-previews/858-companions-in-4-0. This is all, of course, not set in stone. There will likely be changes. This week will likely all be about companions on this blog. So, lets get started with the big picture. Right now, the companion system is pretty static. Each class gets 5 companions (not including the ship robot) through the story. Plus, two companions were released afterwards: Treek and HK-51. That's pretty much it since launch. Some companions received some new ambient dialog for the expansions, but no new stories. Overall, it has been pretty limited. What you had when the game launched is mostly the same as it is now. BioWare is fundamentally changing the system. The new system looks to be more like a collectible system, so you will have a lot more companions to choose from. Some of the companions will retain their heavy story focus, like the five new ones coming in the expansion. Others may just be there to fight with, or craft for you. In the data mining article, creatures were even listed as new companions. So instead of five companions, you may have 20 or more at some point, ranging from some originals, to new story based ones, to more generic ones. I'm pretty excited about the potential of this new system. While I love the story based companions, I would like a more dynamic system where I can work to obtain even more. 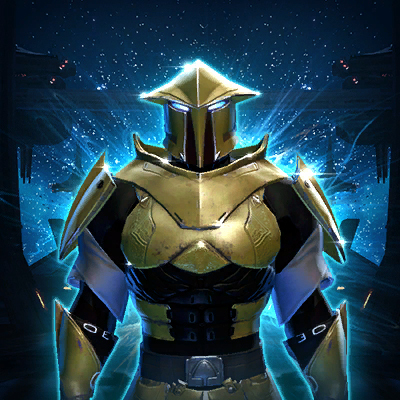 For example, I think a Zakuul Knight would be a very cool companion to be able to get, even if they have no story. I like the look of them. Just think of the wide array of possibilities in the Star Wars universe. So far so good! More tomorrow. Doc is fast becoming my favorite companion. Before it was M1-4X, but the smooth talking Doc may just be overtaking him. If he's back in Fallen Empire, I'll have to get him. What if I have to choose between him and 4X though? Hmmmm. And now for some highlights! Videos are from Forge. 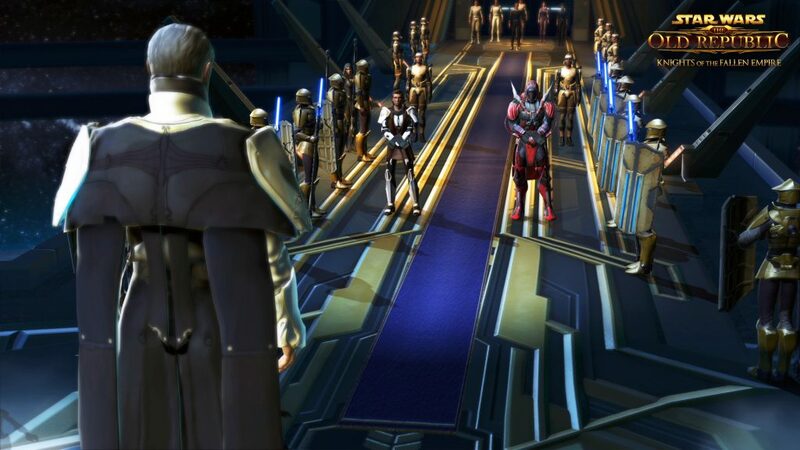 Since the announcement of Knights of the Fallen Empire, the End Game of SWTOR has been at the forefront of discussion. BioWare is doing something different with this expansion, and not adding the typical MMO trappings. So lets talk a little about the End Game situation. Note: these are just my opinions, many others likely feel completely different. Operations. The traditional raid. I don't mind raiding and had a brief career doing it. Now though, I have no interest. I just don't have the blocks of time to devote. It kinda stunk that BioWare used to put story conclusions in these instances. You know what I do like? Single Operation bosses, like the Monolith on Ziost. Put that in Group Finder and I'll do it. Heck, put every Operation boss in Group Finder and I'll be a fan of Operation content. Make it something I can do in 30 minutes. PvP (Ranked). I like PvP quite a bit. However, I do not enjoy 4 vs 4 Ranked PvP. There are a couple of reasons. One, it magnifies the fact that I'm not that good of a player. Two, it can be a pretty toxic environment. You know what kind of end-game PvP I would like? Large scale open-world PvP. In Warhammer Online, all I did was PvP, for years. SWTOR used to have that in Illum, but that has long since died. Dallies. I don't like dallies, at all. It's sad this is considered an end game activity, although some people do enjoy them. The daily zones that were put out were not that great for story content either. I have zero interest in this type of content, except for a single run through. Alts. I guess this can be considered an End Game activity. With 12xp, it's one of the more fun ones. Without 12x, it was pretty boring. Doing the same side quests over and over does not appeal to me at all. As nice as this is, the content will be exhausted pretty quickly. These are just the major End Game activities, there are a number of others: Conquest, Strongholds, crafting, achievements, and so on. Story. With Fallen Empire, BioWare is trying something new and making Story content an End Game activity. Using monthly content releases, they are giving folks who don't necessarily enjoy the above activities something to look forward to. It's certainly a challenge, as people can get through this kind of content very quickly. Mystery. Then there is the 'mystery content.' I think it was Lady Insanity that mentioned BioWare had some new form of gameplay coming. That's all we know. So it may be something, or nothing. What's the right kind of End Game? I think everything above, except dallies ;) I do hope BioWare is able to give everyone something in the coming year. I can't wait for the story content though. One of the only pieces of news to come out of Gamescom was that main state are being combined in the Fallen Empire Expansion. The main stats are: Aim, Cunning, Strength, and Willpower. They will all now be known as Mastery. All items will be changed to reflect the change. Of course, as with any change, some players hate the change and threaten to quit. Is it really a big deal? I don't think so. No choice is being taken away from the player. All Troopers had to use Aim, like all Imperial Agents had to use Cunning. The other stats did nothing for you*. So by replacing them with Mastery, nothing has changed really. Only now, more gear is relevant, and there is no confusion. * Some of the primary stats can provide a pretty small power Tech/Force power boost. Secondary stats/Set bonuses are still there, and will remain the important choice. One possible issue is loot competition in group content. It will increase, but secondary stats will still matter to who wants what gear. Plus, we have no idea if BioWare is changing the drop system. There has been talk about more personal loot. I hate when MMO's are dumb'ed down, sorry, streamlined. However, I am at a loss trying to find a reason that change does this. It'll just make things like gearing your companions easier. We might be losing a little flavor, but it seems like a decent trade. No... and yes. Obviously, eight class stories is as good as you can get for alts. I would love to have had that again, but it's just not going to happen. So we need to put that behind us and move on with our lives. So without that, or even factional stories, how can the expansion be good for alts? You would be surprised how many people play Mass Effect and Dragon Age over and over again. They do different classes and different choices each time. I don't have hard numbers, but just going from what I see and read, it's more than I thought. I never replayed Mass Effect, so that kind of replayability isn't my thing. But it certainly is for a number of people. I don't see myself alting too much with the Fallen Empire content. I'll likely have 6 60's and 2 characters in the expansion. Maybe the choices we make will be important enough to make me want to do more, we'll have to see. I'm not counting on it. There is only so much branching they can reasonably do, and it'll all have to come back to the same general ending. Gamescom, one of the biggest game conferences, is finishing up today. Overall, it was pretty cool to watch from afar. Going into it, I was mainly interested in SWTOR, what with the expansion launching in about 2.5 months. They had some time during the EA press conference, and two four hour Cantina sessions. So what did we learn about Fallen Empire? Nothing. We got about a minute long in-game cutscene trailer and that's about it. Everything else coming out it can be summed up as: "We aren't talking about that right now." Sigh. We were supposed to find out about how companions would work, according to the Community Team. Guess that isn't happening. Normally, that'd be ok. I'm a pretty easy going person. However, Blizzard decided to announce their Legion expansion. Guess what? I know way more about Legion than I do about Fallen Empire. Legion probably won't even launch for 8 months. Remember, Fallen Empire comes out in mid-October. That's what is frustrating. Blizzard talks, BioWare does not. I'm not asking for story spoilers either, just how the systems are going to work. Mark Jacobs (DAoC, Warhammer Online, Camelot Unchained) once said something like "The longer a game has an NDA, the more you should be worried." Well, I'm getting worried about what we're actually going to get with Fallen Empire. If they STILL can't talk about it, how little confidence do they have in what they are doing? Are things still in that much flux this close to launch? What kind of half-baked systems are we going to end up with? These are my worries. I'm sure the story/questing will be good. It's everything else that I worry about. Again, the disparity between Blizzard and BioWare is concerning. They laid out their Artifact system for all to see and told us exactly how it would work. I don't want to have to rely on data miners to get information about the game. But they are the only ones sharing. Maybe BioWare will release a Developer Blog today and prove all this wrong. I can dream can't I? Like I said yesterday, the in-game trailer BioWare showed off at Gamescom was decent. It was't really gameplay, instead just in-game cutscenes. I don't blame them for that though, traditional MMO gameplay cannot compare to what we saw with Star Wars Battlefront. Instead, what really caught my eye yesterday was screenshots posted by Massively Overpowered. Darth Marr apparently plays a big part in the story. I really like the look of the Zakuul Knights. During the EA Gamescom conference, BioWare did indeed show off a new gameplay trailer for Fallen Empire. It was decent, not great though. We do see their new cut-scene tech in action, as there is a lot more movement going on. The end was pretty cool, where the Emperor offers a chance to join him. Is this one of the new major decisions we'll be making? I don't see how that could work, the rest of the game would be wildly divergent. I've been in a Star Wars mood as of late, so while playing SWTOR I have also been reading some of the books. There are many. I just finished up one called Darth Plagueis. He was Sidious's master (Episode 4 Emperor). Overall, I thought the book was very good. Plagueis was an interesting character who was also quite powerful. It was also very interesting to read how Sidious came about. While the book was titled for Plagueis, it wasn't really about him. The start was, but then it was all about how Sidious became Emperor. It end shortly after the start of Episode 1 and the Naboo happenings. I do recommend it though, it was an entertaining and informative read. I've always found it interesting to read about Star Wars. They made the movies, without too much background. Since then, many different authors have been filling in the lore about how all of this happened. Keeping it all straight must be a task, especially now that they are expansing the franchise with Episode 7.